Address: This park is located on McLendon Avenue between Candler Park Drive and Callan Circle in the Candler Park neighborhood of the City of Atlanta in DeKalb County. Surrounding Park Area: Candler Park has several ammenities that are worthwhile – a pool, tennis courts, golf course, large field, several pavillions, and some walking trails. The neighborhood surrounding Candler Park is also quite nice and there are some cute shops down McClendon to peruse at your convenience. Shade: The trees around the playground are large, but they are really not directly overhead the play structures. All the pavillions are shaded though and there is a small amount of shade along the bench area. Seating: Several benches and a wall on the backside of the playground. 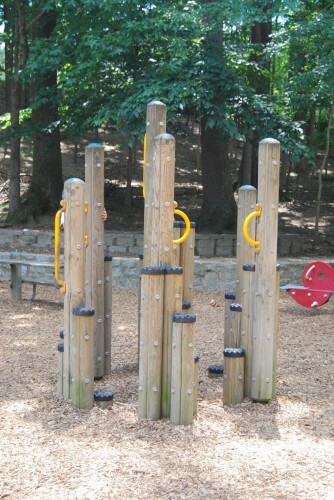 Safety: The playground is wood, so be careful of splinters. Also, if you go wandering around, watch out for flying golf balls. Overall Assessment: Love this playground! It’s wooden and I just love having a play areas that are not the same old plastic playland everywhere. I always give higher marks to play areas that have separate toddler areas from big kid areas. I love that the baby swings are literally in eye’s view of every area of the play ground, so if you are swinging your baby and your big kid is playing, you can see them and yell at them (if necessary!). We love this cute, little neighborhood playground. It’s shady enough and the kids love to climb the steep, wooded hill from the playground up to the tennis courts. The pool is nothing fancy but clean and well-maintained with friendly lifeguards. It’s a great weekend morning playground – grab a to-go biscuit at Flying Biscuit’s take-out counter and head on over!